How Fit Can You Get With Wii Fit? Wii Fit may not take the place of traditional exercise, but it's a refreshing way to stay active with a variety of fun and, at times, challenging balance, yoga, cardio and strength exercises. The introduction of the Balance Board, which records your movements with surprising sensitivity, truly makes this an innovative fitness tool. Whether you hula hoop, dodge soccer balls or settle into Tree Pose, you'll work your balance and agility while having fun. What makes Wii Fit unique is the introduction of the Balance Board. The Balance Board is amazingly sensitive and interacts with the Wii console to measure your movements for each exercise and provide feedback for how you're doing. For some exercises, there's a marker on the screen which tracks your movement and you're a challenge is the keep it within a certain area to win points and unlock exercises. After creating and registering your Mii, a cartoon version of the Balance Board guides you through the weigh-in process and you're given a BMI calculation which designates whether you're underweight, ideal or overweight. You should keep in mind that there are drawbacks to using BMI as an assessment of your health and weight. When you've completed your weigh-in, you'll go through a fairly maddening balance test in which you have to shift your weight to different areas of the board within a certain time period. Wii then uses this information, along with your age, height and weight to give you a Wii Fit Age. If your Wii Fit Age is over your real age (as mine was), that's supposed to motivate you to improve (which it doesn't). I couldn't figure out how they calculate Wii Fit Age or how my ability to balance translates to how to fit I am, so I chose to ignore my Wii Fit Age. From there, you can set a weight loss goal and a timeframe, if you like, before entering the exercise menu where you can choose a yoga, strength, aerobic or balance exercise. One annoyance: You can only do one exercise at a time, rather than having a workout to follow. There are almost 50 exercises included spread across several categories including yoga, strength training, aerobics and balance training. Some of them are fun, like the hula hoop and soccer and others are straightforward strength and yoga exercises, like leg extensions and Downward Dog. The choice of exercises seems strange at times. Some are extremely easy, such as deep breathing while standing on the Balance Board, while others seem too hard for the beginning exerciser, such as the pushup with a side plank and the shoulder stand — a move I wouldn't recommend for beginners. A virtual and very pasty trainer guides you through each move and offers feedback on how you're doing. For some moves, you're required to hold poses while keeping a marker of your position within a certain area on the TV screen. This can be motivating or frustrating, depending on the exercise. For example, Tree Pose is one of the more challenging yoga poses and one many beginners would have trouble with. Doing it on a Balance Board while breathing, staying relaxed and keeping the marker within a very small circle is maddening, even for experienced exercisers. More nontraditional activities are found in the aerobic and balance sections. These include fun things like hula hoop, dodging soccer balls, walking a tightrope, a ski jump and rhythm boxing. While the exercises are fun and get you moving, they aren't terribly intense, although whether you find them challenging will depend on your fitness level and what you're used to doing. Motivating: Wii Fit gives you something to work for. Having your movements tracked and shown on the screen, as well as winning points, adds a competitiveness that keeps you trying the exercises, again and again, to get better at them. You can also compete with other family members to see who can win the most points. Fun: While the strength training and yoga moves aren't terribly exciting, there are some truly innovative games that keep you engaged. The hula hoop, for example, is so silly that you can't help but have fun. Focusing on an actual goal (e.g., avoiding a soccer ball) takes your mind off the fact that you're exercising. Innovative: Wii Fit is one of those games that appeals to all age levels. It's interactive, it's fun and anyone can do it, making it something the whole family can enjoy. No Workouts - One major oversight is the inability to create workouts from the exercises. Doing each move individually feels choppy and unsatisfying. Lack of Intensity - While most moves challenge balance and stability, the intensity level of most exercises falls short of what most of us need to lose weight and get fit. Questionable Exercises - There were a number of exercises that made me cringe (e.g., the shoulder stand) and there are no instructions for modifications or safety considerations. Overall, Wii Fit is a great option for getting off the couch and having some fun. It doesn't take the place of traditional exercise, but it's a great starting point for sedentary people and a fun way to get the whole family more active. 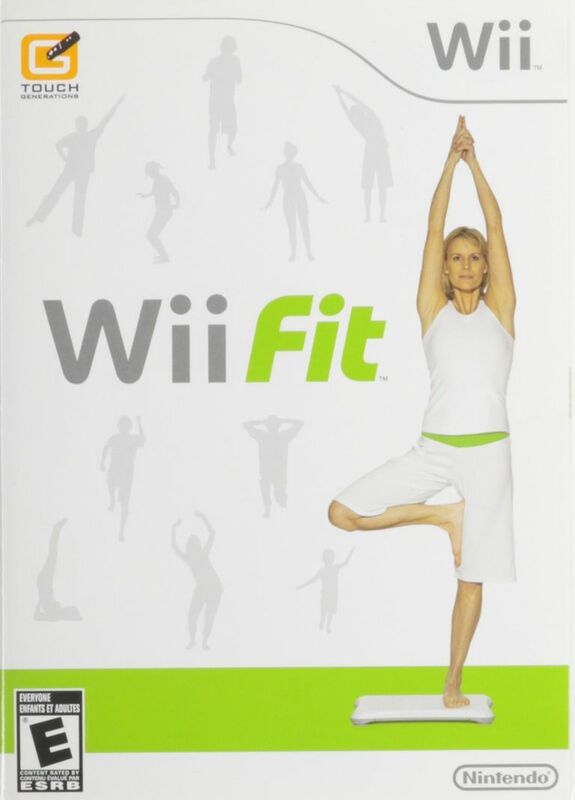 Equipment Included: Wii Fit and Wii Balance Board.